Hôtel Le Bailli De Suffren is a non-smoking hotel is located 25 kilometres south of Saint Tropez offering panoramic views of the Iles d’Or. Guests have free access to the swimming pool, hammam, fitness room and the hotel’s private beach.A Carita Spa is available. The hotel offers soundproofed rooms with sea views, terracotta floors and en suite bathrooms. The rooms at Le Bailli de Suffren also have four-poster beds and private balconies or terraces overlooking the Mediterranean Sea. The hotel has a gourmet restaurant and meals can be served on the terrace, which is situated on the beach. Guests can explore the Cote d’Azur and enjoy local leisure activities such as windsurfing. Le Bailli de Suffren offers massages on site and free Wi-Fi access throughout the hotel. Free private parking is available. Located in the seaside town of Rayol-Canadel-sur-Mer, this art-deco hotel is only 200 metres from the beach. It offers contemporary guest rooms and a outdoor swimming pool, which is heated according to season. Each air-conditioned guest room at Les Terrasses Du Bailli features either a balcony or a terrace. All rooms are equipped with a flat-screen TV, an iPod docking station, a safe and facilities for making tea and coffee. A buffet breakfast is provided every morning and can be served on the terrace beside the swimming pool. A bar is also available on site and meal trays can be prepared upon request. Guests can also enjoy the spa facilities upon reservation at The Domaine du Bailli. 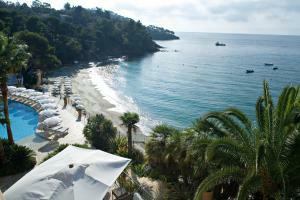 With private parking on site at an extra cost, the hotel is 25 km south of Saint Tropez. Toulon-Hyères Airport is 27 km away. Only 25 km from Saint-Tropez, La Résidence du Bailli offers self-contained, seaside holiday apartments in the picturesque Gulf of Saint-Tropez. It has direct access to the beach. The air-conditioned apartments feature free Wi-Fi access and a furnished balcony or terrace with views of the sea or the surrounding Mediterranean gardens. All have a dishwasher, an LCD TV. You will be welcome with a courtesy tray and a breakfast kit is provided for your first meal. To indulge your appetite, La Praya Restaurant serves a range of gourmet dishes. You can also relax on the outdoor terrace. Only 300 metres from the gardens of Domaine du Rayol with their lush vegetation, La Résidence du Bailli provides free, on-site parking. Le Lavandou seaside resort is 15 km away. Les Iles D'Or guest house is located in Rayol-Canadel-sur-Mer and offers a garden and a sun terrace. 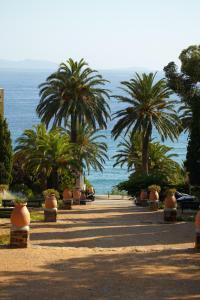 The property is a 3-minute walk from the Mediterranean Sea and 8 km from Cavalaire-sur-Mer. A free WiFi access is available. The rooms feature a bath or a shower and a bidet. They include a wardrobe, heating and marble floor. Some rooms offer views over the garden and the sea. Additional facilities include a shared lounge. Activities in the surroundings include windsurfing, canoeing and hiking. A free public parking is available at a location nearby. 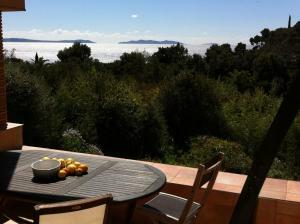 The guest house is a 40-minute drive to Saint-Tropez. Toulon-Hyères Airport is 35 km away. Mas Pramousquier I Le Lavandou is located in Le Rayol-Canadel-sur-Mer, situated on top of a hill in Pramousquier which is 1 km from the sea and 8 km from Le Lavandou. The accommodation will provide you with a patio and a terrace. Complete with a dishwasher, the dining area also has oven and kitchenware. The bathroom comes with a bath. Extras include a washing machine. The terrace of 5 m2 with terrace furniture is in south-west facing position. For shared use there is an outdoor swimming pool ( 20 x 8 m), opened from 15.06 to 15.09. If you feel like visiting the surroundings, check out Pramousquier (700 m). 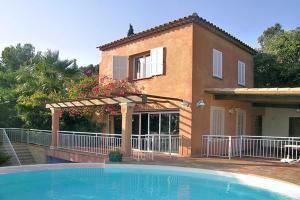 This holiday home is 83 km from Côte d'Azur Airport. Within 2 km you can find several shops and grocers. The supermarket is in 8 km and miniature golf is 11 km away from the accommodation. You can reach the house by approximately 25 steps. Please note that a car is necessary. Located in Rayol-Canadel-sur-Mer, French Coast Villas - Villa La Cascade offers self-catering accommodation with garden and pool views. This property features an outdoor pool, a garden and BBQ facilities. Free WiFi is provided in all areas. The villa includes a seating area, a TV with cable channels and a DVD player. There is a fully equipped kitchen with a dishwasher and a microwave. The private bathroom comes with either a bath or a shower. The property is just 500 metres from the beach and guests will find a restaurant here. Nice Côte d'Azur Airport is located 118 km away.